When the presidents of the Baltic states – Latvia, Lithuania and Estonia – met with President Trump in March, the number one topic was security. With an increasingly aggressive Russian bear lurking on their respective doorsteps, the Baltic leaders were seeking the administration’s reassurance that being members of the NATO still meant they were under the Alliance’s protective umbrella. Trump’s apparent ambivalence towards NATO, insisting that its members in effect pay protection money in the form of the Alliance’s unofficial minimum expenditure on defense had made many European members nervous about America’s continued commitment. Estonia’s security situation is complicated by the fact that almost 25 percent of the population is ethnic Russian: President Putin’s incursion into Ukraine was based on the argument that 17 percent of the Ukrainian population was ethnic Russian. But in a recent interview Estonia’s Ambassador Lauri Lepik told Diplomatic Connections the visiting Baltic presidents had -well, a trump card. All three nations meet the 2 percent of Gross Domestic Product (GDP) minimum expenditure on defense and have done so for years. Estonia (pop: 1.3 million) is the smallest Baltic country, and the most prosperous. It boasts the most technologically advanced system of government in the world (Skype was developed in Estonia). Under a program dubbed e-Stonia, every citizen possesses a personal ID card with an identification number and a login code – in fact, a digital identity – for access to digitized interactions with the state. Estonians can vote on line, as well as file their taxes, consult their medical records, access the health care system, and use digital banking. Estonians can also sign legal documents digitally, without resorting to paper, or a lawyer. As Ambassador Lepik observes, the system is built on mutual trust between citizens and government – but Estonians are notified when the government tries to access their personal government. This total dependence on digitization is transformative, but can also be vulnerable, as in April 2007 when a massive and intense cyber attack by Russia brought the Estonian internet, and therefore the country, to a halt. The attacks on Estonia’s digital infrastructure paralyzed parliament and shut down banks. National newspapers crashed. Ambassador Lepik argues that Estonia survived, but the reality is that the country stopped the onslaught by “going dark” in electronic terms - shutting down its system. Trained as a librarian, Ambassador Lepik has spent most of his diplomatic career either representing his country at NATO in Brussels, or working on security issues in Tallinn. His wife, also an Estonian diplomat, is currently a senior European Union official in the Belgian capital. Diplomatic Connections: Ambassador, a good place to start is with the recent summit of the Baltic heads of state with President Trump. Could you spell out its objectives, and its achievements. Ambassador Lepik: Our focus has always been – and President Trump said it as well - on building a special bond between the Baltics and the U.S., and there’s a lot to be said about what this special bond is. We successfully organized several moments in history where our leaders have met. I was fortunate enough to serve in Washington in 1998 when we created, drafted and adopted the U.S.-Baltic Charter (In which the United States declared a profound and enduring interest in the independence, sovereignty, territorial integrity and security of Estonia, Lithuania and Latvia). What diplomats do is just to create this kind of relationships. Diplomatic Connections: Let me quote you President Vejonis of Latvia, who said in advance of the summit that the Baltic states, “expected a very strong political message from the U.S. expressing support for strengthening Baltic security and expressing, once again, support for the independence of the Baltic states.” In your view, did the U.S. deliver this strong message? Ambassador Lepik: I’m not going to comment on a president’s statement who is not mine, but I think that our independence, or sovereignty, is not in question. We are beyond that point. We’re not going to tell the U.S. administration how to make things happen here, and in third countries. We are quite self-confident; in that sense, there is no need of being reassured. Diplomatic Connections: But one of the issues that all three countries wanted to discuss was security. Ambassador Lepik: Yes, sure. And we’re all concerned, and it was President Trump who actually spoke out on Russia, and on our neighborhood, and on NATO, saying that he is extremely strong in his opinions on Russian behavior, and we agreed. Diplomatic Connections: A lot of people in this country believe that President Trump isn’t strong enough on Russian behavior. But I understand you are reassured. All three Baltic countries are, after all, members of NATO, so you are covered by Article 5. Was Article 5 actually mentioned in the final communique? Ambassador Lepik: The (joint) communique is a two-pager which we drafted, and it’s good reading material. Diplomatic Connections: President Trump must be quite pleased with the Baltic states because Estonia, Latvia and Lithuania have all met the unofficial, unwritten, but these days much discussed commitment that each NATO member must spend a benchmark minimum 2 percent of the GDP on defense. Ambassador Lepik: That’s very well put. Our nation has spent about 2 percent for the past five years or so. It was our deliberate decision. We didn’t go into this benchmark thing, but we have it anyway. Diplomatic Connections: Is there a permanent American military presence in Estonia? Ambassador Lepik: No. There is a French, British and Danish (NATO) army presence. What we’re talking about is a land presence approximately a battle group size of 1,000 soldiers. Diplomatic Connections: Isn’t there also a problem with having to intercept Russian planes straying into Estonian air space? Diplomatic Connections: And are these frequent incidents. Ambassador Lepik: I don’t know that they’re frequent, but it is increasing all the time. Let me put it this way: We are for good airmanship – how the pilots fly – and our point really is to encourage the Russian pilots to adopt good airmanship more and more. Diplomatic Connections: In other words, you think that when Russian pilots overfly your country, a lot of it is negligent flying? Diplomatic Connections: From the Estonian point of view, how much of the concern about Russian aggressiveness is historic, and how much based on a specific threat? Ambassador Lepik: If you take the last two hundred years, we are very much related to Russia and the Russian empire. If we go beyond that, then it’s a different influence - the Danes, the Swedes, the Baltic Sea nations. The Russians weren’t there. Diplomatic Connections: That’s history. But today, is concern about the Russian part of the daily life of Estonians? Ambassador Lepik: It’s part of my daily life. I wouldn’t say that it’s part of the daily life of everyone. Certainly, I don’t want to create a situation where we would leave the impression that the crisis is imminent. Of course, we’re working in the background, and certainly, we’re vigilant, but I wouldn’t say that there’s something bad happening tomorrow. Diplomatic Connections: But it could. Diplomatic Connections: You mentioned that this is your second incarnation in Washington. Ambassador Lepik: Yes, the first time was from 1996 - 2000. 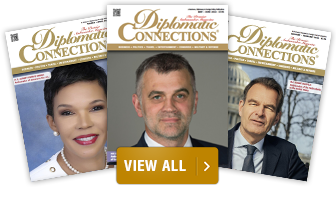 Diplomatic Connections: How has Washington changed for a diplomat in the intervening twenty years? Ambassador Lepik: I think the city itself has improved tremendously, and I commend the city government and the developers who have made a big difference. Washington is a wonderful place to be. Diplomatic Connections: And in terms of work? Ambassador Lepik: In terms of work, it’s a totally different experience from when I was here previously. The goals are different. The atmospherics are different. I can work with all people in the administration; I don’t have any problems with access. So it’s actually very good, and satisfying. Diplomatic Connections: Will you tell us something of Estonia’s total commitment to becoming a digital society through the e-Stonia program, which is actually a government program? Ambassador Lepik: Firstly, I think it’s all about how people see their relationship with the state, and what being a citizens means. We have created this kind of interaction between the citizens and the state, in the sense that citizens can approach directly and interact directly. Secondly, the most important thing is that you have to create trust between the people and the state, and we’ve probably found a way how to do it that may be unique. Trust and a legal framework are at the basis of our digital system: it’s not so much about technology. Diplomatic Connections: Is there – was there – resistance, perhaps from the older generation to this project? Ambassador Lepik: No. I think we have to go back to 1991 (i.e. following the collapse of the Soviet Empire of which Estonia was part), and the political trust, willingness and enthusiasm to re-create the spirit of the country. It was so overwhelming, and because we were under the Soviets for so long, there was a desire among our population to be open to the world. So, what happened was that there was a project started in 1994 called Tiger Leap, and that meant we wanted to connect all schools, libraries and public spaces to the internet. Three generations have so far been exposed to that template. By 1999, as much as 98 percent of all tax returns were filed online. That gives you an idea of how people have accepted this system. Diplomatic Connections: Estonians can also vote online. Ambassador Lepik: Yes. You can vote in the traditional way as well. But voting is one act every five years. Diplomatic Connections: In this country, if anyone tried to link together centrally, and make available, information about individual’s salary, taxes, medical records, banking, education, criminal record, and voting, as you have done, the immediate reaction would be “Big Brother” – invasion of privacy. Was there such a reaction in Estonia? Ambassador Lepik: No. Here I agree that credit information, what we have read about different social media operations – it has all happened. In our case, we as individuals own our data legally, and certainly we don’t mix the credit, banking or other social data together. I have a legal right to ask who has looked at my data. That’s why you have to create, in addition to the law, a mindset, a trust which then enables everyone to live much more creatively with their available technology. Diplomatic Connections: So basically you had to create a system whereby you’re sure – or relatively sure – that what you had access to, others do not. Ambassador Lepik: Precisely. More importantly, there has to be a debate in a society within the parliamentary framework focusing on how can we cope with all the new technologies, and start-ups, and it has to be open and public. You just can’t somehow sneak this in. That’s the only reason people trust it in Estonia. Diplomatic Connections: In 2007, you had the traumatic Russian cyber attack that lasted for days. What effect did that have on Estonia’s commitment to go digital? Ambassador Lepik: First, we saw the need to create this private-public relationship within the society – and even beyond that, internationally - to tackle those kinds of attacks. We had that, and that’s why we survived it. Secondly, we created in NATO, the cyber center. In 2008, I took all our NATO allies to Tallinn to discuss cyber defense policy. We came up with this idea as well as established it. Diplomatic Connections: Which is used NATO-wide? Diplomatic Connections: Estonia seems to be start-up heaven. You have cyber projects starting up all the time. Ambassador Lepik: Right. It’s all about unleashing the creativity of people. Therefore, we are number one in Europe for start-ups per capita. Diplomatic Connections: And the other thing about Estonia is that you can get residency in Estonia without actually being there. Ambassador Lepik: There’s a program of residency. One gets a digital card, so that if you have a business in Estonia, for example, you can access all your business accounts, your business’ taxes online. It doesn’t simplify getting a residence permit, or a passport, and it’s not a tax haven, either. Diplomatic Connections: Does it give you Estonian citizenship? Ambassador Lepik: No. We started that about two years ago. And world-wide there are about 35,400 new residents, 2,096 from the U.S. Most come from Finland, the second most come from Russia, third from Ukraine. Diplomatic Connections: This is useful if you have a business in Estonia. Ambassador Lepik: Or you can establish a business. If you want to have access to the European market, that’s a good starting point. A business can be established in Estonia and you can run it from the U.S. or anywhere in the world with all the access that you need, without having to travel back and forth. You’ll maintain all the system connections that your business requires to operate – bank accounts, signing documents, etc., while secure communication is provided. Diplomatic Connections: It also increases your population. Ambassador Lepik: Yes, indirectly. There are two points to remember. First, it is secure. Our chip card is coded: this is not credit card access, as in the United States. The second point is that legally, our digital signature has the same standing as written with a pen. That saves the nation 2 percent of GDP per year. You don’t need to go to a lawyer to sign papers, you can do it all yourself, and it doesn’t use any paper. Diplomatic Connections: The lawyers must not like that much. Ambassador Lepik: They have other ways of making money. Diplomatic Connections: Does every Estonian citizen has a chip card, because without one you can’t exist? Ambassador Lepik: You can, probably. But then you have to do everything manually. Diplomatic Connections: We’ve talked about Baltic relations with the United States. But how would you characterize Estonia’s bi-lateral relations? Ambassador Lepik: I think they’re growing. What my government and the U.S. are trying to do is to expand the scope. It’s not so much about security, which is still a centerpiece, but we do a lot of cultural events, educational and trade as well. We’re a small nation, but hi-tech trade is up and coming – actually, happening already. Diplomatic Connections: What would you like to have achieved during your time in Washington as ambassador? Ambassador Lepik: I would like to have seen Estonian business expand in the U.S.; additionally, I would like to see our experience and our knowledge in the digital world, what we have created with our technology proliferate here. It’s all about how to serve our citizens better - and you can do that through contact with the state governments. What I’m trying to do is to find ways to introduce our approaches to different governors in various states, and I think that’s important. Diplomatic Connections: What kind of reaction are you getting? Ambassador Lepik: Very positive. People are going back to Estonia with focus and determination, we’re achieving a great deal by working with different state governments, facilitating introductions and such, that’s my goal. Diplomatic Connections: So as far as hi-tech is concerned, Estonia is a proselytizing nation. You not only practice hi-tech, you also preach it. Ambassador Lepik: We do – and it’s kind of fun as well. Diplomatic Connections: Is there an Estonian diaspora in the U.S.? Ambassador Lepik: There is a small one, but the nature of that specific population is changing at the moment. There was a very strong refugee diaspora (during the Cold War). Now people are coming in with different goals. I am traveling across the United States to meet those people in Los Angeles, San Francisco, Michigan or Florida. In Silicon Valley – but if we’re speaking about diaspora, they’re all over. 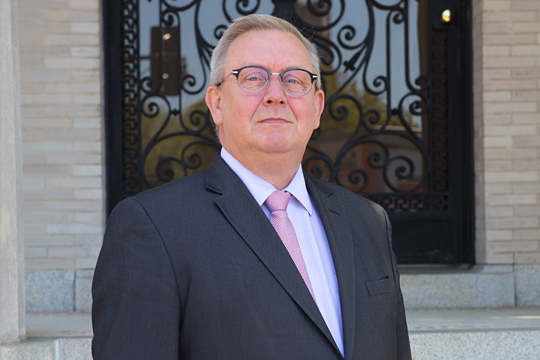 Diplomatic Connections: Thank you very much, Ambassador Lepik, for this interesting and informative interview with Diplomatic Connections.